Peloponnesus with Attica and Part of Boeotia. 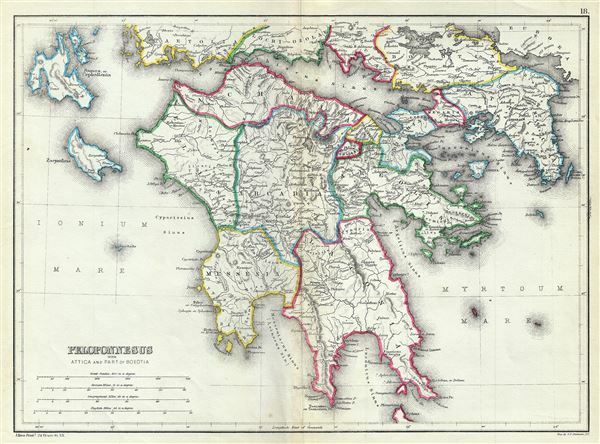 This is a scarce 1867 map of southern Greece during ancient times by William Hughes. The map covers the entire Peloponnese Peninsula including ancient Attica and parts of ancient Boeotia. The map notes several roads, towns and cities and uses both contemporary and ancient names - an invaluable resource for scholars of antiquity. Following the Battle of Corinth in 146 BC, the Greek peninsula came under Roman rule. The period from 31 BC and AD 180 in Greek history is described as the era of the Pax Romana. This was a period of peace and security when many Greek cities flourished, leading to cultural and economic progress. The classical period in Greek history, which lasted from the 5th century B.C. through the 4th century B.C. greatly influenced the Roman Empire's politics, art, architecture, philosophy and literature. After the fall of the Western Roman Empire, Greece became the center of the Eastern Roman or Byzantium Empire. This map was created by William Hughes, printed by J. Bien and engraved by G.E. Sherman, for issued as plate 18 in Sheldon and Company's An Atlas of Classical Geography. William Hughes (c. 1818 - May 21, 1876) was a cartographer, engraver, lithographer, printer, and publisher active in London during the middle part of the 19th century. Hughes enjoyed and long and varied cartographic career. He was elected a Fellow of the Royal Geographical Society in 1838 and, from about 1840, taught geography and mapmaking at St. Johns College for Civil Engineers. He later taught the same at both Queens College and Kings College, London. For a time he was employed as a map librarian for the British Museum. Hughes began engraving maps around 1839 and worked with most of the prominent British map and atlas publishers of his era, including but not limited to Charles Knight, A. and C. Black, George Philip, William Cassell, and others. Joseph R. Bien was a topographer and an engineer working the later part of the 19th century. His name appears a number of state and regional atlases, including the important 1895 Atlas of New York. Most of Joseph Bien's work was published in conjunction with the New York Lithographing, Engraving & Printing Company, which was founded by Julius Bien. Joseph was almost certainly related to Julien, though whether he was a son, cousin, or brother, remains unknown. Sherman and Smith (fl. c. 1829 - 1855), sometimes working as Stiles, Sherman & Smith, were American engravers active in New York City during the middle part of the 19th century. The firm including John Calvin Smith (surveyor and engraver), George E. Sherman, and sometimes, Samuel Stiles. Their work primarily focused on government publications, including the maps and engravings prepared to illustrate the official records of the 1838-42 United States Exploring Expedition (U.S. Ex. Ex. ), maps issued for the Army Corps of Topographical Engineers, and various U.S. Coast Survey Charts. They also engraved privately for Thomas Bradford and John Disturnell, among others. Sherman and Smith maintained offices at the corner of Broadway and Liberty Street in New York City and were highly regarded as the finest cartographic engravers in the city. Their non-cartographic legacies include George Inness, who apprenticed with them for two years before going on to become a well regarding American landscape painter of the Hudson River School. Sheldon and Company, An Atlas of Classical Geography constructed by William Hughes and edited by George Long, (New York) 1867. Very good. Minor wear and toning along original centerfold.